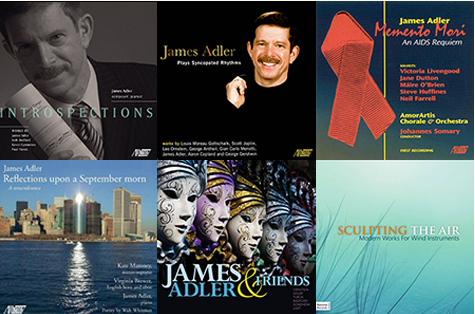 The AdlerOaks Music Library publishes contemporary choral, orchestral, and chamber works of James Adler. Works published by AdlerOaks are available through a number of distribution sources. Check out the list of works for score and sound samples and ordering details. The American Record Guide has just reviewed A Winter Triptych, saying: "The two instruments sound wonderful together (Brahms knew it too); and what a pleasure to hear Christmas music that sounds unabashedly happy that it's Christmas. The performers sound delighted to be involved in the holiday music making. The recording of James Adler's A Winter Triptych by the Judson Memorial Church choir is available from Albany Records, iTunes, and amazon.com. Read more about this work. The Lesbian & Gay Big Apple Corps Symphonic Band, under Artistic Director Henco Espag, will present the World Premiere of James Adler's FANFARE XL at their 40th anniversary concert on April 13 at St. Bartholomew's Church, 325 Park Avenue in New York City. Mr. Espag and the band asked Mr. Adler to write this piece in honor of their 40th anniversary. Tickets are $25 - $35 and can be purchased here. The concert begins at 7:00 PM. James Adler is featured (for the second time) on Garrett Hope's podcast, "The Portfolio Composer." On this program, Garrett and James discuss the release of "A Winter Triptych," beautifully recorded by the Choir of Judson Memorial Church - New York City, under the direction of their splendid Maestro Henco Espag, on Albany Records. Listen to the podcast here.